The new Apple In-Ear stereo earphones make your smartphone music sounds extra amazing. This is ensured by the integrated wind and noise suppression, making this headset ideal for outdoor activities. i9s Description:Feature:More refined appearance, smaller earphones, not making your ear get pained after a long-time wearing. More stable signal and better quality.Magnetic suction charging case, giving you better sense of experience.Light and small, easy and convenient to carry.Style:In-Ear,Wireless Type:Bluetooth,Model Number:mixed model,Support APP:Yes,Connectors:NoneSupport Memory Card:No,Function:Sport For iPod For Mobile Phone HiFi Headphone,Is wireless:Yes,Volume Control:No,Control Button:YesResistance:9Ω,Support Apt-x:Yes,With Microphone:Yes,Communication:WirelessVocalism Principle:Hybrid technology , Sensitivity:123dB 15 meter connection distanceFrequency Response Range:8-25000Hz,Waterproof:No,Active Noise-Cancellation:No,Plug Type:Wirele. Fit Design And Perfect Stereo Sound can be used as Bluetooth headset. Bluetooth 4.2 technology the TWS i10 max is compatible with most Bluetooth ready device. Charging case Headset very light and easy to carry in your pocket. Dual earbud design, lightweight and ergonomic for fatigue free comfort. 2 x Bluetooth headphones (Left and Right Earphones). Bluetooth version: V5.0 EDR. Close your phone bluetooth and also make sure the headset full power. 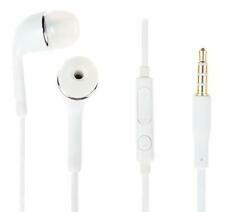 Bluetooth Wireless Earphone for Smart Phone or Tablet. Bluetooth Specification: 4.1 EDR. 1 x Bluetooth Earphone. Play/Pause:Short press the "MFB" button to play and pause when headset is in standby mode. 1 x Bluetooth Earphone. You may also like. NOTE:We have Black,Green,Red Color in stock,please leave a note to choose what you want ,or we will send randomly!!! 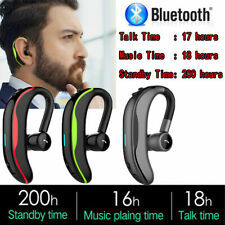 Bluetooth Headset Wireless Earphone Rotatable Headphone Stereo Earbuds Handsfree Power Display Voice Prompt. Sports, Music, Life Acoustically engineered to produce exceptional frequency response for an enhanced listening experience. Enjoy richer, more detailed sound from your smart phones, tablets, and audio devices. Feature: ♬【High Quality Chip】: Superb Sound Quality Headset With High Quality Chip For Best Stereo Sound And Superb Bass Sound. Clear High & Low Volume. Make You Enjoying The Music True Wirelessly ! ♬【50mAh 450mAh】: Built in 50 mAh Lithium Polymer Battery And Come With Intelligent Charging Box With High Capacity Lithium Battery Provides 3-4 Times Charges For Continuous Use, Make You Enjoy Music or Watching TV&films For a Longer Time,Make Sure More Convenient To Carry&charge When You Mountaineering, Hiking, Biking or Other Outdoor Sports..
IPhone 6S |6S Plus, iPhone 6 | 6 Plus, iPhone SE, iPhone 5 | 5S | 5C, iPhone 4 | 4S, iPhone 3GS, iPhone 3G. iPod classic 120GB (2008), iPod classic 160GB (2009), iPod nano 4th Generation,iPod nano 5th Generation, iPod nano 6th Generation, iPod nano 7th Generation, iPod shuffle 4th Generation, iPod touch 2nd Generation, iPod touch 3rd Generation, iPod touch 4th Generation, iPod touch 5th Generation 32GB/64GB, iPod touch 5th Generation 16GB, iPod touch 6th generation. V1 is a new kind of BT headphone with its s unique design. Bluetooth Version: V4.1. Bluetooth Profile: A2DP1.3, HFP1.6, AVRCP 1.6, DI1.3. 1 Headphone. 2 Ear bud. 1 User Manual. RF Range: 10m. 1 Charging Cable. Bluetooth version: Bluetooth V5.0 EDR. 1 x i11 Bluetooth Headphones(left and right earphones). Strong compatibility and compatible with devices as long as they are Bluetooth support. Item Type : Bluetooth Earphone. Built-in microphone. A key to answer a call. - Invisible, smallest and ultralight design. Get rid of the cable connection, bring more comfort in sports, sports and other activities. Get rid of the problems wire. Bluetooth headset connected to the phone after the shutdown, and then open the bluetooth headset will connect back to the phone automatically, more convenient;. Earbuds Battery Capacity:50mAh. 1 x Charging case. Get an unrivaled sound quality and call clarity. 1 x Mini Bluetooth Headset. Bluetooth version: V5.0 EDR. Noise cancellation: CVC 8.0 noise reduction, built in HD microphone, inputting high quality voice, and promoting a call conversation of the transmission performance. 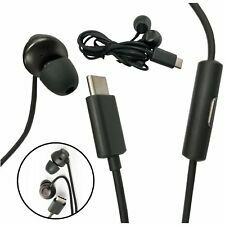 Bluetooth headphone Wireless Magnetic Stereo Earphone with Mic Headset Black. 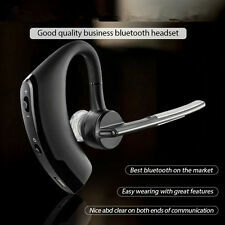 Bluetooth 4.1 Magnetic Earphone Sports Wireless Stereo Mic Hands-free Headset. Wireless Bluetooth Earphone Sports Stereo with Mic Headset For iPhone XR XS Max. 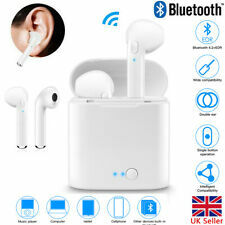 Wireless Bluetooth Earpods Headphones Earbud Headset Charging Box For All Phone. Bluetooth Version: Bluetooth V4.2 EDR. 1pair x Bluetooth headphones (left and right). 1 x USB charging cable. Output Power: 30mW. Get an unrivaled sound quality and call clarity. 1 x Mini Bluetooth Headset. Bluetooth version: V5.0 EDR. 1 x User Manual. 1 x USB Charging Cable. Transmission Distance:10m. Color: Black. Bluetooth Version: Bluetooth V4.2 EDR. 2 x mini Bluetooth headphones (left and right). Cash and Cheque is not accepted. Suppoted file formats:A2DP1.3/HFP1.6/HSP1.2/AVRCP1.6/D11.3. Battery Capacity:65MAH/950MAH. Wireless Bluetooth 4.0 Headphone Hands Free Car Kit Headset Music Voice Earpiece. Type: Headset Earpiece. Wireless Technology: Bluetooth. Microphone: Built-in. Features: Built-In Microphone, Call Functions. 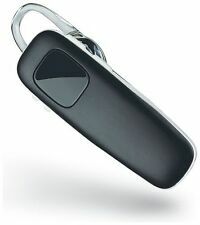 The Bluetooth headset enables you to enjoy great sounds on-the-go. Comfortable and snug fit make sure the headset stays tightly when you are out running, jogging or exercising and doing other activities. Using Type: Inner Earphone. 1 X Earphone. It can be connected with 2 bluetooth devices simultaneously. Inner microphone enables HF calls. Plug Type: Wireless. Voice guide and calling number prompt are supported. Style:In-Ear,Wireless Type:Bluetooth,Model Number:mixed model,Support APP:Yes,Connectors:None. 2 x Earphones. Wireless Type:Bluetooth 5.0. Frequency Response Range:8-25000Hz,Waterproof:No,Active Noise-Cancellation:No,Plug Type:Wireless. 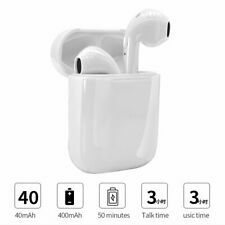 New Wired Bluetooth Earphones Earbuds Headphones For iPhone 7 8 Plus X XR XS Max. Plug in the earphones. Once paired with your iPhone, it will automatically connect up when you put in the earphones. It can be connected with 2 bluetooth devices simultaneously. Plug Type: Wireless. Effective Range: 10m. 1 X USB Cable. 1 X Earphone. Dual earbud design, lightweight and ergonomic for fatigue free comfort. 2 x Bluetooth headphones (Left and Right Earphones). Color: Black earphones White Charging box. Bluetooth version: V4.2 EDR. Unable to find your earphones when a call is coming?. This bluetooth headset can easily solve the issue. With strong magnetic absorption, it can be fixed in the car air conditioning vent position. - Comfortable Fit: Lightweight design with a comfortable ear tip that conforms to the shape of either ear for a stable fit. IPhone 6S |6S Plus, iPhone 6 | 6 Plus, iPhone SE, iPhone 5 | 5S | 5C, iPhone 4 | 4S, iPhone 3GS, iPhone 3G. For Apple iPhone 4 5 5c 5S SE 6 6S Plus (7 8 X By Using Adaptor, Not Included) iPad iPod. RoseGold Handsfree Earphones Headphones With Mic. CSR Bluetooth 4.0 Wireless HD Stereo Earphone Headphone Headset with Microphone Free extra wired earphone. • Ergonic earbud, comfortable to wear. • Voice Command :Say "Yes" to Answer, Say "No" to Reject. 1 x Pair of Bluetooth Earbuds. Connected by Bluetooth 4.2 with faster pairing, lower energy consumption and more stable signal. Bluetooth working range: 10m. Bluetooth version: 4.2. 1 x User Manual. 1 x USB Cable. Model: i10 Max. Earpiece DesignEarbud (In Ear). Item Type : Bluetooth Earphone. Bluetooth V5.0. Bluetooth Frquency: 2.4GHz. Bluetooth distance: <10m. Compatible with: Bluetooth Supported Devices. Wireless TechnologyBluetooth. Wireless Bluetooth 4.1 Headphones Stereo Headset HIFI with Mic Calls Mp3 Music Earbuds for Samsung iphone. Excellent bluetooth wireless headphone allows you to receive calls while on the move or in the office. STEREO BASS EARBUDS FOR iPHONE | ANDROID PHONE -- In Ear Earphones | Earbuds for iPhone 6s Plus / 6s / 6 Plus / 6 - iPhone 5s / 5c / 5 / SE - iPad Pro / iPad Air / Air 2 - iPad mini 2 / mini 3 / mini 4 - iPad 4th gen, Beats Pill - iPod Touch 5th gen / iPod Nano 7th gen.
Wireless Headset Head-mounted Bluetooth Headphone Stereo & Cable Mode Earphone. 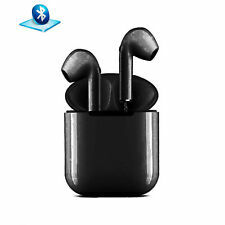 Bluetooth headphone Wireless Magnetic Stereo Earphone with Mic Headset Black. Bluetooth 4.1 Magnetic Earphone Sports Wireless Stereo Mic Hands-free Headset. M5 Bluetooth Headphones Earphones Stereo Wireless Earset Running Headset With Mic Earbud BT 4.1. Bluetooth Version: 4.1 EDR. 1 Magnetic Wireless Earphones. 1 Usb Charging Cable. Noise reduction:CVC6.0. Stereo music Bluetooth headset. 1 Bluetooth headset. Comfortably fits either ear,suitable for all Bluetooth enabled devices. Bluetooth V4.0 technology, easy pair and fast transmission speed. Bluetooth version: V4.0. V1 is a new kind of BT headphone with its s unique design. Bluetooth Version: V4.1. Bluetooth Profile: A2DP1.3, HFP1.6, AVRCP 1.6, DI1.3. Dear guests, the product and the picture have different appearances. Item Type : Bluetooth Earphone. Bluetooth version: Bluetooth V4.2. Fit For: Apple iPhone 6/6S/7/8/X, iPad, Notebooks, Samsung, Android, LG, etc. Strong compatibility and compatible with devices as long as they are Bluetooth support. 1 x Bluetooth earphone. • Sweat-proof technology: protects your earphone from coffee spills or gym workouts. • Voice recognition: simply say “yes” or “no” to manage calls. • Noise cancelling: cancels background and wind noise.